Hey Everyone! It's Wednesday! You know what that means! It's time for some cleaning tips! I know you're excited..You ARE excited..right?! 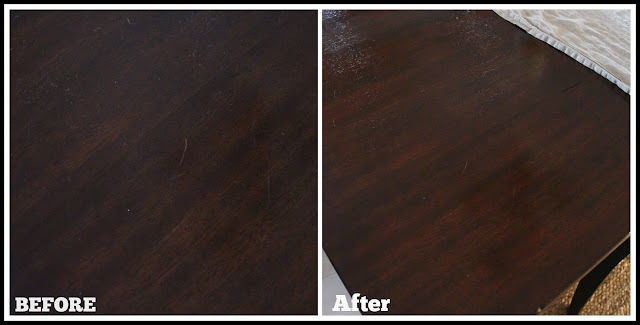 I shared a tip with you all on Instagram a few weeks ago a little tip for removing scratches from wood surfaces.. some of you have already tried it and took the time to tell me how it worked for you! I'M SO GLAD!!! You might have heard this tip before, as I'm sure it's not something new. But I can tell you, that when I learned it. I was MIND. BLOWN. No. Seriously! 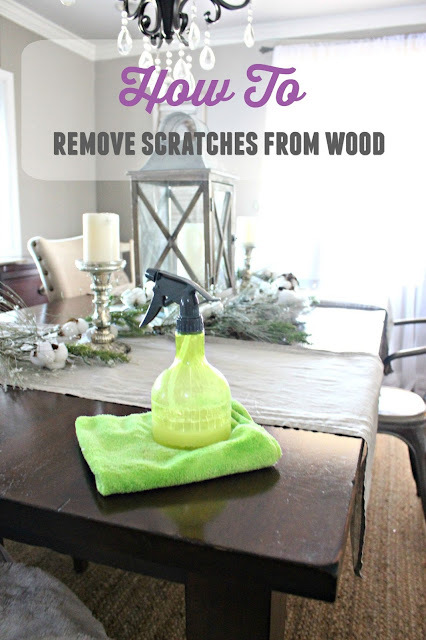 I was scratching wood surfaces purposely just so I could clean it up! Okay..maybe I'm being a little dramatic but not much. And all it takes is two ingredients most people already have. I'm always bringing home old furniture pieces so this little tip was seriously a game changer for me, when I first tried it, I was like. NO WAY will this work. NO WAY. But it does, and here we are! Now, please keep in mind I only have light surface scratches on my wood table, mostly from just throwing bags and things on it all the time. This will NOT work for deep scratches, unfortunately. I CAN tell you though, that even if you don't have scratches on your surfaces, this mixture will still make your wood shine for DAYS. I'm always amazed at just how well it works. You ready for the magic mixture? The secret ingredient here is.. Mix it all up in a spray bottle and squirt small amounts, working in small sections and going against the grain rub the mixture into the wood. So simple and easy! And yay for a pretty shiny table, right?! I do this typically every other week or so,since we don't eat at this table it doesn't get super messy! So try this and tell me what you guys think and if it worked for you! I love to hear your thoughts, tips and opinions! Also, any other options you have for removing scratches from wood or another surface! Let's chat on IG or Facebook! I love that it's all stuff you have at home! Great hack! Say whaaaat?! So easy and it's everything that I already have. Fortunately we don't have any scratches on our table (yet) but with two small kids I know that they're coming! So so easy! Thanks for the tip!